"We have a great product, but I don’t know how to sell it. I hate selling." It’s not uncommon to hear these "horrible" words from a business owner. Raise your hand if you’re in the club! Promoting and selling a product IS really a pain for many techs. Yet, selling is vital for a business. Otherwise, its days are numbered. But who said that to effectively sell your products, you must stand in front of an audience of prospects, all in a cold sweat, in an effort to sell this freaking pen? Good news, man, you must not. We live in a blessed time. A merchant has a large number of choices to put a product in front of potential customers — without any physical or eye-to-eye contact at all. It’s they who will come. Interested, eager to pay. Not you, who will knock on the closed doors. That feels SO much better, yeah? According to a forecast by Statista, over 2.14 billion people worldwide are expected to buy physical products, digital goods, and services online in 2021, up from 1.66 billion global digital buyers in 2016. There are buyers, they have spare cash, and they’re looking for products online. That’s where you could list (and sell!) your products. A strong reason at least to consider some online presence for your business. How much to sell a product for? How much does iPhone 7 cost? — from $549. So, Apple sells for the price that is twice as much as it actually spends to produce it. Another example — Toyota Motor, its margin is around 8%. Both Apple and Toyota are sure-footed well-known businesses with millions of buyers. Why are the figures so different? The answer is simple and complex at the same time. You do have to take into account, how much it costs to produce (as well as pack, ship, and service) your goods. But the best price is defined not by your expenses. The right price is what the market is willing to pay. And it’s based on the customer-perceived value. As a product manufacturer, you’re most probably focused on the functional and monetary value. 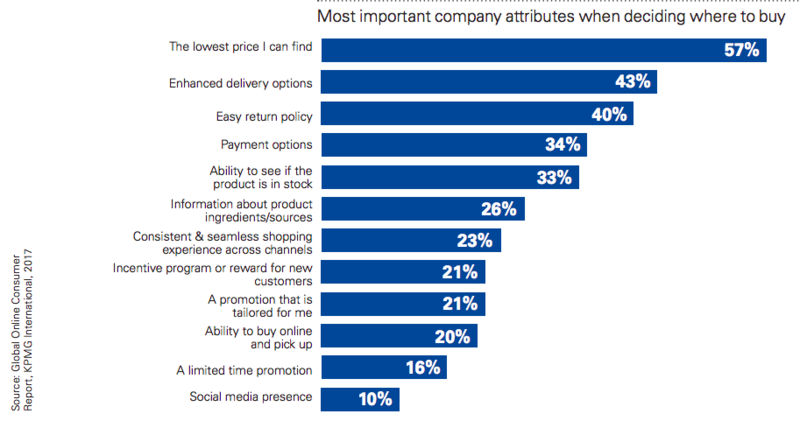 But social and psychological value also contribute to customers’ purchasing decision. The ratio of all 4 differs, depending on your product, niche, target audience. So, sorry, there’s no universal formula, how to calculate how much to sell a product for. Thorough market research data, advanced analytics skills, deep understanding of statistics — that’s probably the right approach. We need something more digestible and democratical, right? A quick way to determine what your stuff is worth. See what other people are selling similar items for! Check out the competitors. On Google. On eBay. Or where do they sell? (Make a mental note of this, too. If they sell there, you also can!) You will anyway need to analyse the competition to define the USP for your marketing activities. This price will be a starting point for your pricing experiments. How, why and when to play around with the pricing? Please check out this article on Inc.com for practical recommendations on when to raise/lower your price and how to do it right. Meanwhile, we will move forward. I have some vital info for a would-be online seller. Target Market — what a beast is it and where to find it? This entire article by Marc Andreessen is a pretty interesting read for a beginning eCommerce entrepreneur, but the essence is that "The #1 company-killer is lack of market." A target market is a group of potential customers that you will aim your marketing efforts towards. They share some geographical, demographical, psychological characteristics that will define your marketing strategy: where and how to advertise, what tone and messaging to use, and so on. The best way to find a target market is to find and solve real problems that people (for B2C) or businesses (for B2B) face. People buy products and services to satisfy their needs of different levels (from basic ones like hunger to the ones located at the top of Maslow’s hierarchy of needs like creativity and respect of others). Businesses buy something either to decrease their costs or to increase their revenue. It does not necessarily need to be a mass problem. Vice versa, you may “cross out” some segment of prospects for the sake of “specification” on the broad market. It may become your unique selling proposition. Say, there are thousands of resorts, but opening the one for plus-size visitors only has seen an excellent response. So, what if you’re not a genius to see business opportunities? You do not need a one-of-a-kind product on the market to sell successfully. Even if someone is already solving the same problem, you also can. There are numerous niches where the target market is not still stuffed. This is opportunity research of the best eCommerce niches containing Google Trends Score, PPC and SEO difficulty and opportunity, price and margins. It is a must-read for those who haven’t taken a decision yet, what exactly to sell online, but is serious about opening an online store business. And there’s more. Here’s a bunch of simple ideas that you can use right away to choose a profitable products to sell online and avoid common mistakes. A great product can create strong demanding market itself too. But in an ideal scenario only. No one can guarantee that it will happen to YOUR business. So you’d better not count on your product creating a new market from scratch. Instead, do your best to explore the market and reach the Product/Market fit. Product/Market Fit — what are the signs that you’ve found it? 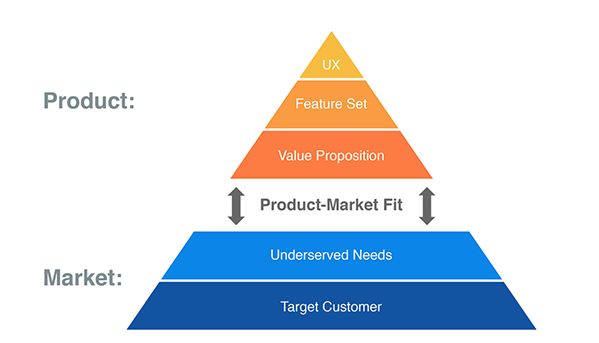 "Product/market fit means being in a good market with a product that can satisfy that market", Mark Andreessen writes. How do you feel that the Product/Market fit is reached? You’re hiring like crazy to pack up your team of sales, customer support, developers (for the software) or product assemblers or whoever — to produce and sell more, as the market remains "hot" and "hungry". You’re getting "entrepreneur of the year" awards, as a bonus. Investors are crowding, reporters are calling, word of mouth is spreading. You’re stroking your beard or moustache, or rub your hands, or do whatever else that exhibits your satisfaction when you’re comparing the MoM, QoQ and YoY results. If the time flies, and you’re sadly concluding that you haven’t managed to hit the score, it means that you should try changing your strategy, going after a different market or building a different product. That means another round of everything, as it equals to starting from scratch. Costly, costly, costly. That’s why you should have a clear understanding of what your target audience is (creating your buyer personas, as it’s usually called in "proper" guides), estimate its size, study the demand — and do that all before you roll out your super-duper product to the market. One more thing you should keep in mind is Buyer Behaviour. Understanding how people shop online and what is common for them will help you sell more. Carrying out research for this guide I have found a diamond of the first water. "The truth about online consumers" is a fresh report about worldwide shoppers in 2017, published by KMPG. I would like to cite some of their findings below. It’s based on the survey filled in by 18K+ customers. Based on this list, we can come up with the best practices to sell a product effectively in 2017. 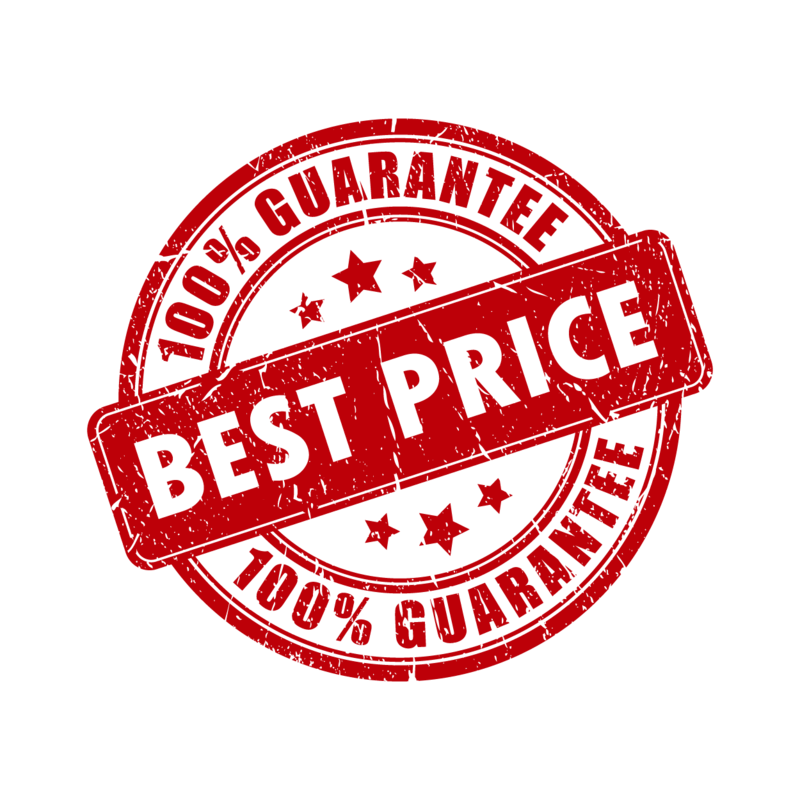 Offer "Best price guarantee" not to be beaten by the price set by your competitor. Offer a customer loyalty program, bonuses for returning customers, for referring a friend and so on. Buy one — get one free, spend X — get a bonus, it all goes here too. People love free stuff, and all those "gifts" give them a deceptive impression of savings. 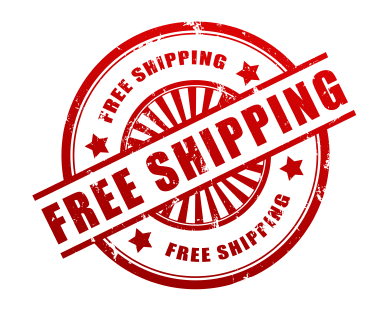 If you can offer free shipping, do that, and make sure your home page clearly informs the buyer about such a bonus. Offer several shipping options with different costs and timeframes. Some buyers are fine with waiting, as long as the order is delivered for free. But think of a poor spouse who has just realized that the marriage anniversary is tomorrow. Receiving a gift is a matter of the highest urgency and they will be happy to pay for expedited delivery! Offer More Ways to Pay. The top eCommerce websites accept credit cards, but to succeed in 2017, you need to go way beyond simply accepting credit cards. Offer Apple Pay and Samsung pay, enable PayPal. Give your customers more time to pay. PayPal Credit, Klarna’s Smooth payments let your customers buy now, but pay later. Make sure your checkout is very fast and optimized for both desktop browsers and mobile buyers. See if you can diversify your checkout to make sure none of your clients leave because they can’t use their favourite payment method. A well-written product description is a key. Attach a specification, give detailed information about both product benefits and features. Upload a sufficient amount of eye-candy product photos that illustrate all the facets of the product you sell online. Display the stock info, as well as enable "back in stock notifications" for low-stock items, if this feature is supported on your eCommerce website. It will help you to return the potential buyers to your website. Cyber Monday, Black Friday, Christmas Sale — used to these “traditional” marketing campaigns, the online shoppers are waiting for these days, preparing for huge savings and discounts. If you don’t jump on the bandwagon, you may never see record-beating sales. Personalized promotion is not only about free stuff, coupons and savings, but also about product upsell. If the shopping cart contains an iPhone X, be sure to recommend Apple Watch, a Case and other compatible accessories. Chances are, the order totals will double. The stats below seems to be about the same — the purchase decision. But while the above one is about WHERE to buy an item, this pie chart is about WHAT to buy. The first one is interesting for resellers that distribute the goods that many other online stores offer. This one is especially useful for brands who sell a unique product. 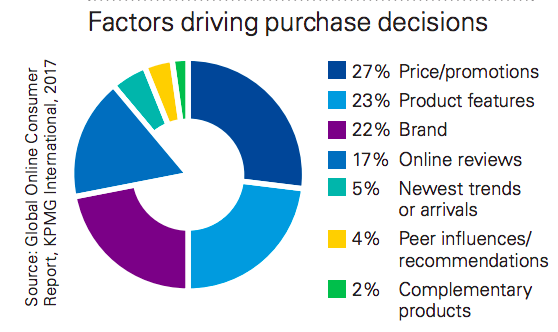 So, what contributes to a positive purchase decision? Note that the features of the product make as low as 23%. You brand name adds another 22%. Promotions, online reviews, trends, recommendations by friends and influencers occupy the rest. A trendy word “hype” may also come to your mind. A bright example of the hype is the popularity of dumb fidget spinners this spring: they flooded classrooms, causing teachers to confiscate them. They broke into the list of Amazon’s bestsellers. They were sold in every mobile-phone shop and kiosk. You’ve got one too, right? But a fidget spinner was a fast-to-come-and-fast-to-go-away product, just like Pokemon Go, Tamagotchi and alike. And you do not want a spike followed by an inevitable and painful slump. You want a stable growth. How to achieve stable growth of sales, keeping in mind the factors driving purchase decisions? …wherever and whenever it is possible: on your website, in social media, on Amazon. Research shows that up to 91% of people read online reviews, and 84% trust online reviews as much as a personal recommendation. 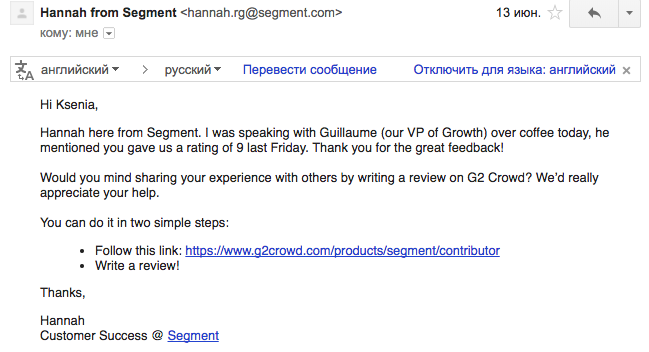 Another guide of ours, Email Marketing in Ecommerce, contains a chapter about Transactional emails, and there are several tips with examples of how to request customers’ reviews. 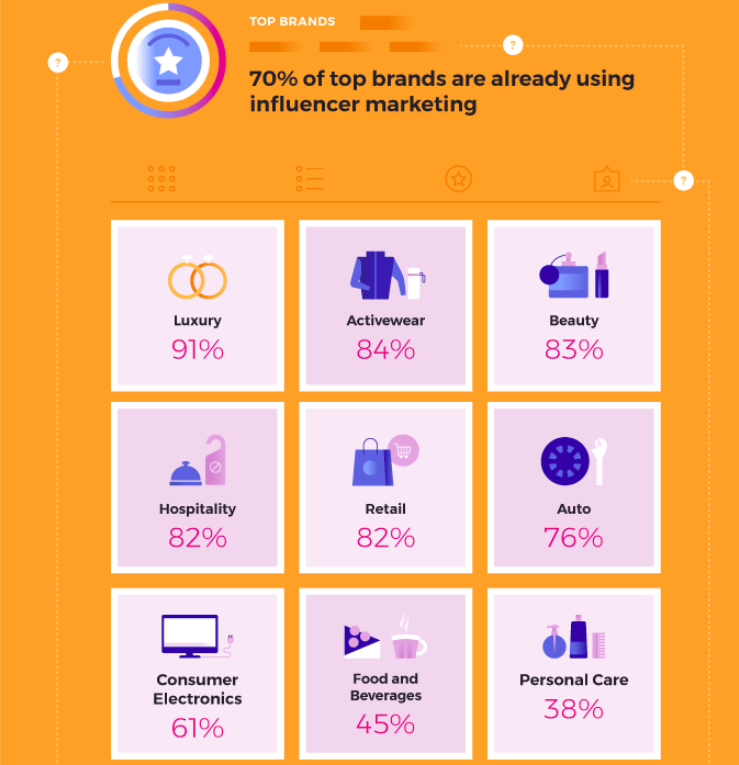 Influencer marketing is a very fruitful strategy, as long as it’s done right. If you want to learn, who is an influencer, how to find the right influencer, how much the top influencers charge and why a micro-influencer is a better choice than a celebrity, please check out my recent post about Influencer marketing on Instagram. Paid Ads. We make a wry face when we hear “paid” in the context of advertising. It seems it will cost crazy money one can hardly afford. But you can advertise effectively yet stay within your budget. Create a strong selling message. Narrow the audience in accordance with your Personas. Use more specific keywords with lower competition, rather than broad terms. Set the display time keeping in mind the daily routine of your buyers. Use A/B tests to choose the best-performing ads and analyse why they work better. The magic is that the better your ad, the more specific it is, the cheaper it costs you. It’s explained by two facts. First, the bid-based system is cheaper, when the competition is low. Second, the advertising platforms are interested in showing relevant high-quality ads, because it means more clicks, hence — money paid to them. Where to advertise if you’re selling a product online? Advertise on Instagram, Facebook and Twitter. Create a campaign with Google Adwords to show your product on the first page of SERP, even if you’re not there organically. Try a proven way to promote your offers to the prospects and customers. The complete email marketing guide with actionable step by step instructions will help you. Enable a sponsored listing on eBay and Amazon. I don’t know =) But you do: advertise there, where you customers spend time. The report by KMPG also covers such a question as "purchase duration" that varies by category. Sure thing, pricing plays not the least role. People are more likely to make and impulsive purchase of a Diorshow Mascara for $28.50, rather than immediately buy Samsung Q9F QLED TV for $3497,99. The product complexity also matters. The more features it has, the more time it takes to study reviews, decide if these features are worth paying for a given buyer or not, compare the product with competitors. Time-limited offers. 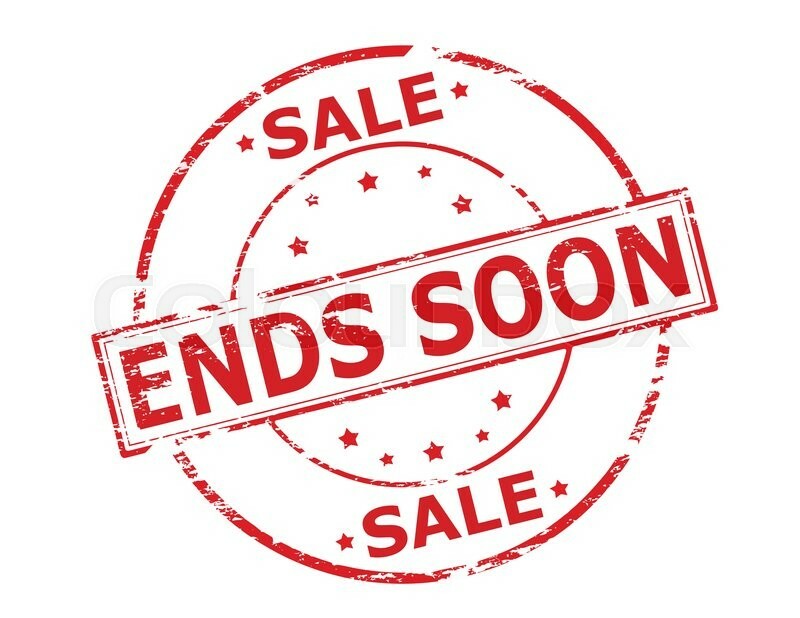 Even a 40% discount can make no hit if you give your customers too little time between the announcement of the special offer and its expiration time. Trial period, if you sell software or services. Abandoned cart reminder delay time. If you’re selling simple and not too costy goods like books, sending a shopping cart recovery email with a coupon the same or next day may give you best results. In case of expensive fancy-schmancy electronics you may want to follow up the potential customer a bit later. How much does it cost to sell a product online? You do not expect that it will cost you nothing to sell online, do you? ‘cause if you do, sorry, man, you’re all wrong. Selling products online is a serious business that helps you earn $$. It would be strange to expect the other companies are willing to help poor you just out of kindness. They’re also businesses.They need to pay salaries and taxes, maintain infrastructure, they have lots of costs and they also need to be profitable to remain on the market. If you choose a free hosting, prepare yourself for the fact that it will show ads to your store visitors — or just not be able to cope with the requirements of eCommerce website at all. If you’re looking at a free eCommerce solution, be ready to pay for every little feature that goes out of the box in the "youngest" paid plan. If you’ve chosen a free listing on eBay, don’t get surprised that you don’t see many orders coming, because the competition in the category is high and sponsored listings are pushed to the buyers aggressively. Does it mean you should pay everywhere? If you’re a small business that is just starting, the minimally paid plans may be a good beginning. Say, running a Free X‑Cart edition on the Starter hosting plan will cost you $29.95/mo (free installation, fully managed highly productive VPS hosting, Shared SSL certificate). Unlimited products, unlimited users, no transaction fees except the ones that you pay to your credit card processor, regardless of the eCommerce solution in use. Read more about X‑Cart as Saas. Basic Shopify will cost you the same 29/mo plus transaction fees equal to 2% of your order totals (in addition to the fees charged by the payment processor of your choice — PayPal, Authorize.Net, Chase Paymentech, etc.). Selling on Amazon will cost you from $0.99 per listed item plus about 15% of the "referral fee". eBay will "bite" at least 9-10% of every your sale, on average. At least, for goods in category "Baby clothing", "Barbie", "Wristwatches" and "Cat food" with a fixed price equal to $20. All calculated for "none" or "basic" type of your eBay store. As soon as you feel that your eCommerce business generates some income, and it’s not only your personal finance that makes the entire project budget, you will be able to invest more, upgrading your plans and accounts. If you’re still having a greed attack, look at it this way: the costs will occur anyway. Should you sell products in your own web store or in a popular online mall, in a brick-and-mortar store or in a pop-up shop, the expenses are in every corner. Yet, online shopping is trending and this trend keeps growing. On Black Friday 2017, the customers were spending online as much as $1 million per minute, according to Fox News. Some of these millions could be yours if you create your online now. Let’s take a closer look at the possible options of WHERE you can sell a product online. The best thing about it is that everything is yours. Your design. Your vision of the best buying process. Your rules. Your goods, no matter how weird they are. Especially if you use a self-hosted eCommerce solution like X‑Cart, Magento, PrestaShop. But even SaaS like Shopify or BigCommerce gives you much freedom. You choose, what shipping carriers to connect, what payment options to enable. You monitor the most recent industry trends and decide if to jump on the bandwagon or not. CDN is not another news channel, and so on. Running your very own online shop makes you some kind of Jack of all website-related trades. Website management A-Z. 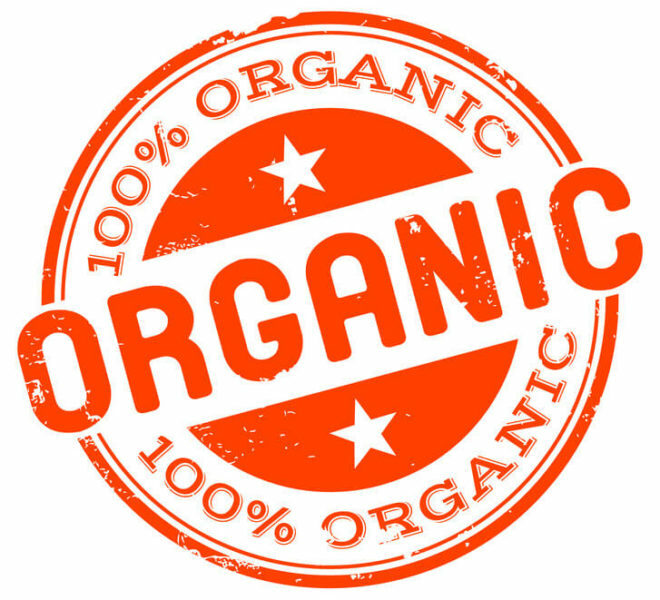 Creating SEO-friendly content. Advertising on Google, Bing and Yahoo. Driving website traffic from affiliates. And the largest pain of every webstore administrator is attracting customers. If you have just launched your store and started selling online, you will be struggling to get the first visitors. If your online business has been up and running for a while, you will always want more. This is of course doable. Even for a non-techy. Even for a person who is far from all that eCommerce world. Even for a mother of three. Even for a… what are your other possible excuses? Cross them out and see a success story of Anne from Pitimana, who could. 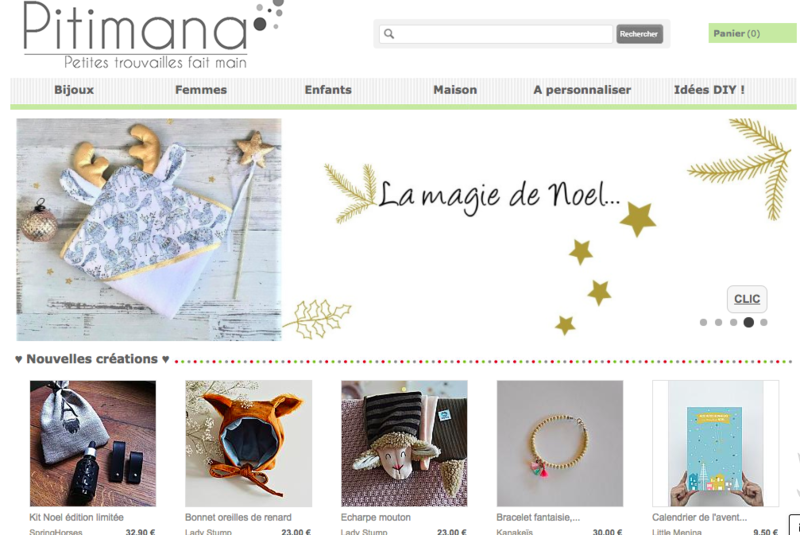 She built Pitimana.fr, the largest Handmade Marketplace in France, and probably, the cosiest online store I have ever seen. If you really want it, it’s never too late to start, nor too early. The best moment is always NOW. The right question is not when, but HOW. If you’re not ready for all the responsibility of starting your own eCommerce website, there’s another way to sell products online — register as a vendor, or seller, in an online marketplace. That’s a place where product manufacturers and resellers list their items to get access to the audience of millions. Remember the largest problem of the website owner? Tadaam, you’re not the owner, it’s no longer yours! It’s the headache of the marketplace administration to drive traffic to the mall. You do not care about Search Engine Optimization, advertising etc. Website technical issues are not what bother you in the night. Stress tests for Black Friday, DDOS attacks from hackers will hardly visit you in a nightmare. Focus on orders fulfillment. Keep inventory in stock, ship items, earn stars in customers’ reviews. Amazing, yeah? But selling on Amazon or eBay or Etsy, you’re to pay a number of fees, that will “bite” a piece from you’re selling the products for. Social networks are flourishing, and social commerce is booming too. According to our recent research, it’s Instagram, Facebook and Pinterest, where your marketing effort will be the most rewarding. Companies use SMM to interact with their loyal customers and potential buyers. In a friendly, relaxed manner the brand can communicate its message to the audience, provide all the information customers need to research and compare, build trust, sharing the user-generated content. But having built a healthy community of real followers and subscribers, you can use these channels for real sales. Twitter’s "buy" button, Facebook shops, Instagram’s shoppable ads and link in bio convert these follow-like-comment-only apps into a fruitful source of orders for your business. Selling on Instagram is such a huge topic that I could not put it into a single chapter and it has grown into a standalone guide. How to get followers and likes, how to advertise and how to make your Instagram account shoppable, all spiced with examples and figures. Open it in a new tab for future reference and keep reading this chapter, as we have a couple of important questions to discuss. I remember I promised no eye-to-eye contact with your customers. But they will still be calling and emailing you, asking questions about your product, shipping, moneyback policies and hundreds of other different things. They will be asking, even if you have written about it on every possible page, including product information, FAQ, company policy and anywhere else. Arrrgh! I hate it, but no one reads attentively enough. Only Google, maybe, when indexing the pages. But not your customers. Never. it is safe to buy products from you. that your product will work best for them. that buying now is better than buying the next week, and so on. But it is different. It’s they, who found you over the Internet already. It’s they, who are interested. And this is so much easier. Understand your customer. Do not pitch your product from the very first seconds. Ask questions to understand their needs better than your own ones. Listen to the answers. Know both your product inside and out. "Eat your own dog’s food", when possible. It will help you understand the customer’s needs better — and improve the product, too. Say, we used X‑Cart Multivendor to power the addons marketplace, and as a result, packed the platform with a dozen of new features. Now we are seeing the stable growth of sales — with genuine pleasure. Coincidence? Nope. Be honest about your product. If you feel like it will not solve the customer’s problem, either try to customize it to become the best fit, or advise the best substitute by a competitor, if you know. Honesty is the best policy. Reputation matters. Go the extra mile for your customer, when required. There will always be exceptions: you do not ship to this state. You do not sell abroad. You don’t have enough in stock right now. Probably, huge brands can afford to lose a sale because of “rules”. The smaller ones are better to seize every opportunity and not to let the prospect go. At least, offer the options, even if they cost extra. Go omni-channel. Long story short — you place your customers at the very heart of your marketing strategy and take care of them the way good doctors care of their patients. This approach to retail has already changed marketing considerably. And it still keeps kicking up the dust among eCommerce businesses all over the world. We’ve got a separate article on this strategy. I’m sure you’ll find some good food for thought there. If you do some quick research, you will discover a way more tips on selling your products online. You can start with this article (carefully written by Anna Lynn Dizon) which includes actionable tips and advice on how to make your business as customer-centric as possible. Did you know about the ‘Four I’s’ rule that can help reinforce long-term engagement with your customers? I didn’t. What about using the unusial ways to greet your customers? Have you read that far? High five, man, you have all chances to become a Sales Guru — even without a salesman bone in your body. Keep learning! I invite you to read the further chapters of this guide, but you have just done a great job studying. Now is the time for a coffee break, so please bookmark the page and go take your hot fragrant award!